An enduring, sophisticated love story spanning decades and three continents. Set against a spectacular backdrop of Safari Africa, New York and France, the love stories from Africa are the very essence of this remarkable debut novel. Love, betrayal, passion and death are woven into this romantic novel with exquisite skill. A book to read and to relish. Samantha Ford is destined to become a contemporary romance bestseller with her stories from Africa on this form. A letter found in an old chest on the island of Zanzibar reveals the secret of Kate Hope’s glamorous but anguished past, and the reason for her sudden and unexplained disappearance. Ten years previously Kate’s lover and business partner, Adam Hamilton, tormented by a terrifying secret he is willing to risk everything for, brutally ends his relationship with Kate leaving her devastated and feeling totally betrayed by her former lover . A woman is found murdered in a remote part of Kenya, bringing Tom Fletcher back to East Africa to unravel the web of mystery and intrigue surrounding Kate, the woman he loves but hasn’t seen for over twenty years. In Zanzibar, Tom meets Kate’s daughter Molly. With her help he pieces together the last years of her mother’s life and his extraordinary connection to it. The Zanzibar Affair is a different view from mine, so far removed; I feel that I might not quite understand what Africa means to other people. This is the thought that filled my mind at the ending of this story. For Kate Hope, Africa is a place where she found love, lost it, lost it again, and then it found her. Love found her in the most unexpected person. 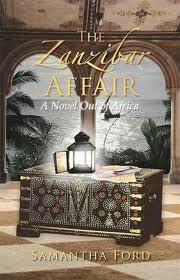 This book is a jaunt into the life of an expatriate living life from one African Country to the next. It spans a lifetime of life in Lagos, Swaziland, Cape Town, the beautiful Diani beach, and ends off the coast of Tanzania. Kate lives an adventurous life exploring the lush wildness of the continent. She has three loves, in the space of the three decades, but her second love damages her soul, so much that her last love almost loses her entirely. This story is about Kate’s quest to find happiness and love. She has a passion for tourism, and the tourism business in Africa. This passion made her successful in business and in her career, but this same passion brought her the most pain. She has three loves. Her first love gave her a daughter, Molly, but he wasn’t strong enough or committed enough to stay with her. Adam, her second love, was the one she lost herself in. He broke her heart and her spirit so deeply she might have died. She found great joy with him, but he broke her heart so deeply she never found happiness until the last minute, and from someone she thought she’d lost. Her third love was probably her first love, but he’s the one who cared enough to go chasing after her at the end. This is the reason he is her third love, and the last one. When I was reading this, I kept hoping for relief for Kate, just a sense of hope or light at the end of the tunnel. Tom, her last love, quickly became my favorite character, to me; he was the beacon of hope in the entire story. I kept wishing he’d find and rescue Kate. Therefore, the ending relieved me. This is a story of a woman who has lived, and lived hard. She made tough choices, survived great tragedies, and endured the most heart wrenching love stories. It’s all very realistic and heart wrenching. It is definitely a revealing view on what life can be like for an expatriate living in Africa.